Emojis have been called the world’s fastest growing language. Unsurprisingly, how societal diversity is represented by emojis is to the fore. Icons for gender, ethnicity, race, sexual orientation, skin colour, and lots of other dimensions of the richness of human identity have been appearing in each emoji release. It is only right this happens. 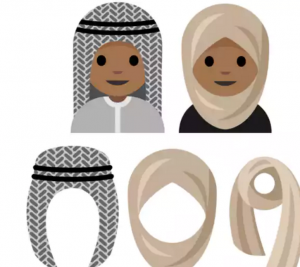 The Guardian has a great story about Rayouf Alhumedhi, a 15 year-old Saudi student in Germany, who noticed that the currently available emoji set did not include one for a muslim woman in a headscarf. Rayouf has worn a hijab since she was 13 years-old. Rayouf decided to do something about this emoji omission by making a proposal to the Unicode Consortium, including draft designs for icons that include how male and female wearers might be represented. The BBC also reports on the support for the proposal (the personal Bitmoji already includes an image of a woman in a hijab, by the way) and how debate about it covers such areas as religious freedom, female equality, secular traditions, fears of terrorism, and multiculturalism generally. Although this proposal for inclusion and to be recognized by the tech world is based on religious and identity grounds, it is clear, as Rayouf acknowledges, that you don’t have to be a muslim female to wear a headscarf. A bit like a burkini, really. A final version of the proposal is planned for presentation to the Unicode Consortium in November 2016.